My story, "La Bomba Grande," started with this seed: that a young, Mexican girl, without any formal scientific training, was going to do this amazing thing in science, unlock this great riddle, and then, to make things even more spectacular, she was going to tie science and God together in a way that would be shocking. Basically, this one girl was going to change the whole world for the better. Normally, I cannot identify where I got a particular idea for a particular story. But in this instance, I know exactly when and why and how. The inspiration was a very creative, young girl who did not like physical science one bit and happened to be in my physical science class the first year I taught high school. At the end of each chapter, I usually gave an assignment to write a short essay on that chapter and discuss all the different scientific principles inside of it. I don’t imagine it was fun for them to do, for this girl in particular who flat-out told me she did not care for my class or science, preferring, of course, art. And these papers were certainly not fun for me to grade, until one day, the day this teenage girl, fourteen or maybe fifteen, turned me upside down. Instead of the normal paper, she wrote me a fictional tale about a girl who went looking for frogs after a storm. At first I was a little angry. I was going to give her a big, red zero, maybe even write her a nasty note about it. But the beginning of the story had been intriguing and, me being interested in good, captivating fiction, I read on (the girl had hooked me). As it turns out, in this somewhat lengthy story, the girl had incorporated every single scientific principle from the chapter into the plot and weaved them in there so seamlessly that a person would never suspect it was not simply a short story. It was the most amazingly creative thing I had ever read in my life and it changed things for me, how I approached my own fiction, and how I would teach science in the future. For me now, physics and fiction are not two separate things. They are the same thing, and they both need creative, fertile minds where anything is possible. I would learn a lot about this girl and my other students that year, the class of 2013. Contrary to all that I had heard about teenagers, especially the things I had seen in the movies, they were not that scary. In fact, they were very simply the best group of people I have ever met, the most sincere, the most fun to be around, certainly the most creative. I started an MFA program after that year and I will graduate next month. To date, eight of my stories have either been published or have been accepted for publication and, fingers crossed, my first book, Volcano Wars, will have a publisher soon. But "La Bomba Grande" was the first. If it were not for "La Bomba Grande," there would have been nothing else. And if it were not for those amazing teenagers, there would not have been "La Bomba Grande." 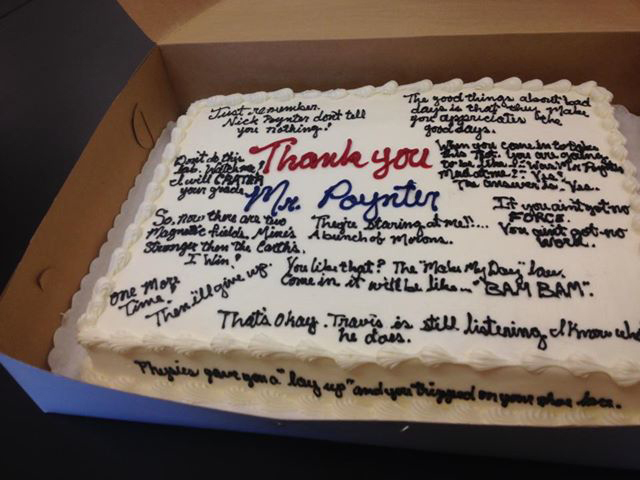 This is a picture of the cake Poynter's students got him when they graduated in May. They quoted all the crazy things he told them throughout the year. They say a good teacher does more than just teach, that a good teacher inspires students. Fair enough. I buy that. But what about teachers being inspired by their students? That is what happened to me. Nicolas Poynter left teaching after that year, but returned last year to teach senior physics, the senior year of the class of 2013. He has since left teaching again. His story Loma Prieta Blues won the 2013 Vuong Short-Story Prize and will be published in the next issue of Florida English. 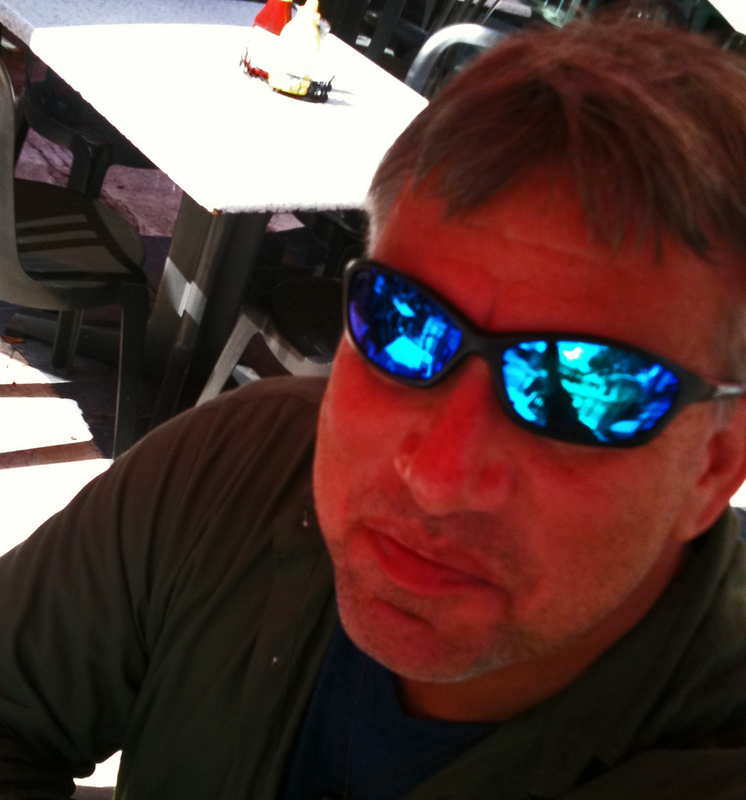 Nicolas's story, "La Bomba Grande" is featured in issue 297.3 of North American Review.